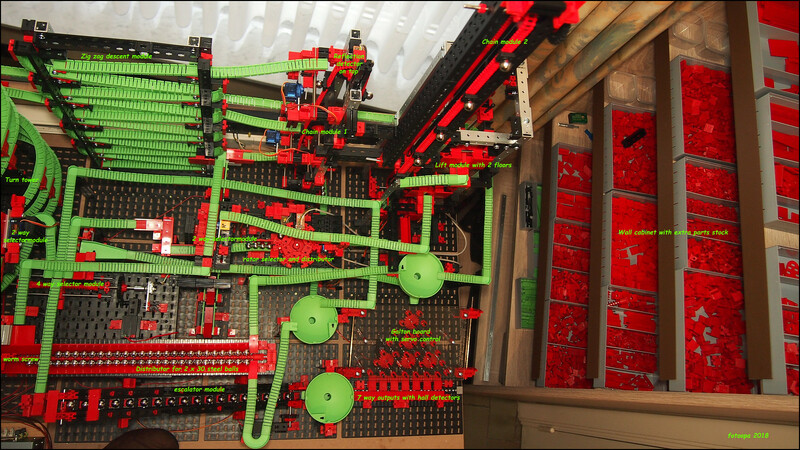 Sorting would then have to go very fast with Fischertechnik building blocks, a few servo's and a fast color sensor. But this module has to wait until my super marble track is ready. Glass marbles do not have a stable and correct diameter, hence they can not be used in the existing Fischertechnik. I just made a new video "Galton Board simulation"
In the video, other modules are visible in the back ground, but they are not actively switched on. The neoleds have not yet been used actively. This all demands a lot of time and software programming. However, it is the intention to work on it for a long time. That is the advantage when you are retired. Video is quite short but gives a general impression of the super marble track. fotoopa hat geschrieben: Glass marbles do not have a stable and correct diameter, hence they can not be used in the existing Fischertechnik. - Yes, they really have wide tolerances and roundness is sometimes bad. 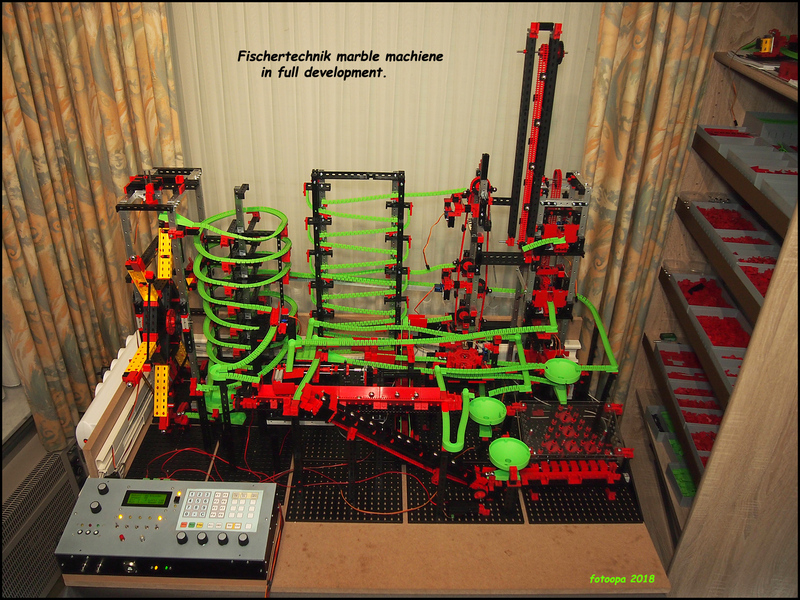 - No, you really can use glas marbles with fischertechnik. Maybe not in your currently existing fischertechnik ball run. But if you take into account the tolerances then you can get quite impressive effects. H.A.R.R.Y. hat geschrieben: - Yes, they really have wide tolerances and roundness is sometimes bad. 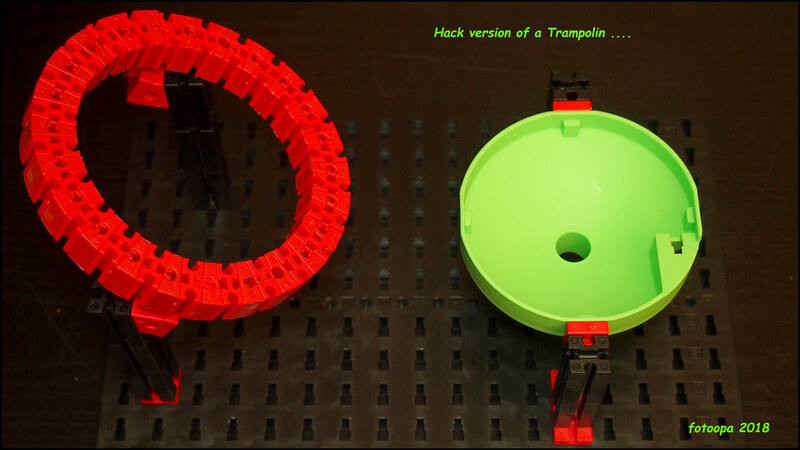 I've already measured a lot of glass marbles, but they all have a too large diameter to run in the dynamic XL tracks. I would be very happy if there were colored marbles with a diameter between 12 and 13 mm and preferably in full colors. Then I could add a fast sorting process based on color. Most marbles have a diameter of 13.5 mm or more. Most color-based sorting examples with Fischertechnik building blocks that I have seen so far are quite slow, I would like it much faster! Just crawl the web and you might find the smaller sizes. I personally prefer schusserland for their excellent service and they might tell you how to get well tolerated coloured balls. Thanks H.A.R.R.Y. for the links. I did not know that there were so many kinds of marbles anyway. You apparently have many more opportunities in Germany. Fortunately, online orders still exist. I'm certainly looking at those 12mm versions. the stuff you recorded so far looks really amazing. I am looking forward to more videos. This thread motivated me to put my dynamic XL together, which I had not managed so far. The Rob hat geschrieben: Hi Frans, the stuff you recorded so far looks really amazing. I am looking forward to more videos. This thread motivated me to put my dynamic XL together, which I had not managed so far. There will certainly be a lot of videos available. I have focused on everything with multiple Dynamic XL boxes (just now 5x). I already have Fischertechniks from the 1980s. The XL construction box is somewhat unstable. You have to take care of it mechanically well. My priority now is mainly on stability, reliability and safety for the grandchildren. On the other hand, my hobby is electronics, mechanics optics and high-speed photography. And I have a lot of time, I am 74 years old. Nobody forces me to finish something quickly. That is why I am working on this project for a year and it will continue for a long time. I am now testing a large lift with 2 floors and servo controlled doors on each floor. 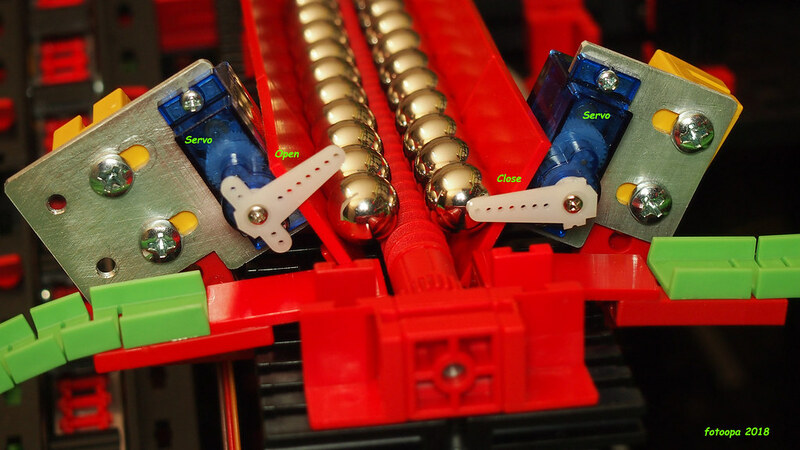 The supply of the steel balls is done with the rotor distributor module from the previous video. As soon as both work together, I make a video of it. Fischertechnik marble machiene in full devlopment. Some parts of the trajectories are complete so that a test run can run. 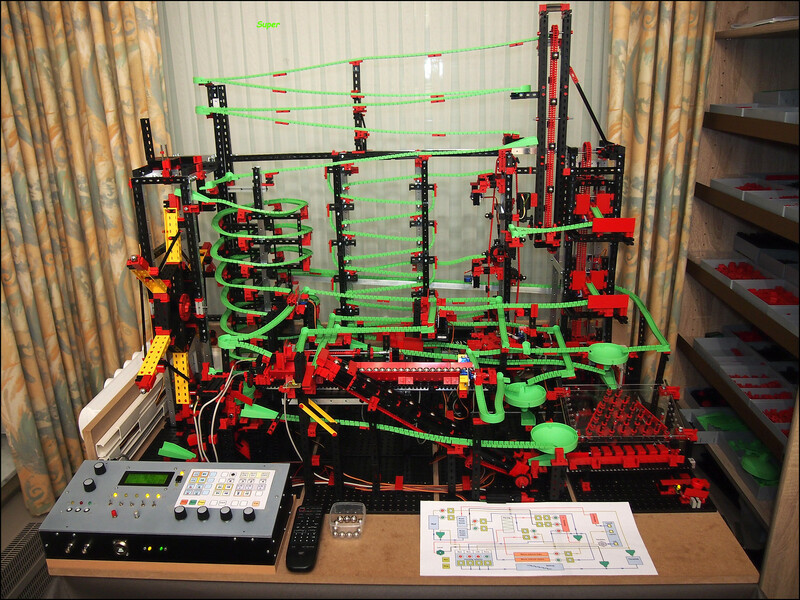 It is mainly the servo motors that have to be finished via a separate control panel. The neodym magnets are in the modules but most of the detectors still have to be connected. We are now working hard on that. When the entire trajectories with servos and detectors are ready I can make a nice video. To make this possible, I had to write more than 4000 lines of verilog code for the FPGA. Everything is built up from scratch, no external libraries, only the classic tools that come with the Altera Quartus development package. Those tools are mainly for making dual ported ram. I use only 3948 LE of the available 22.000 LE's. So the load on the chip is very low. As a super user I can set motor speeds, trim servo positions, use encoder positions etc. All this is now finished. As soon as the panel for the grandchildren is finished, I can make video recordings. I'm going make very soon a new photo of the complete finished track. I have built a small Kugelbahn with old Bauteile. Simple stop module for the Fischertechnik "super Kugelbahn" with servo control. Here a dual version. There are 2 channels, one left and one right. This allows the steel balls flow to be controlled. The servo used is a low-cost version less than € 6.00. A video will follow later. Trampoline test on my super"Kugelbahn". Through this short video my adaptation to build an own version of a trampoline. I do not have to wait until March when the real version comes out. The short video shows the supply of the steel balls via the worm screw. 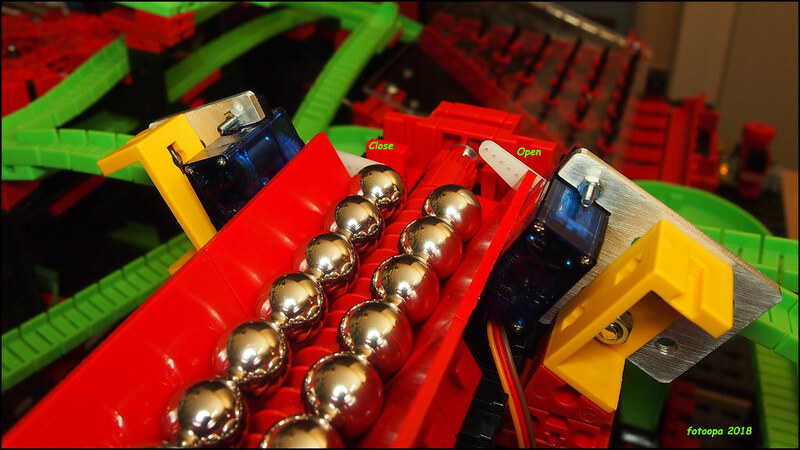 The passage of the steel balls is done with a servo. Other recordings follow later when the operating interface for the grandchildren is ready. Please keep reporting from this great project! First, the design of the basic controller with a FPGA module was made. This took more than 6 months. This included the electronics design, electrical scheme, PCBs, soldering of components and testing. After that, the I/O modules were designed and the necessary input and outputs were determined for the FPGA module. In total, there are almost 100 connections to the FPGA. After this period, the construction of several separate Fischertechnik modules was started. Because the basic controller could already work manually, all these modules could be tested separately. 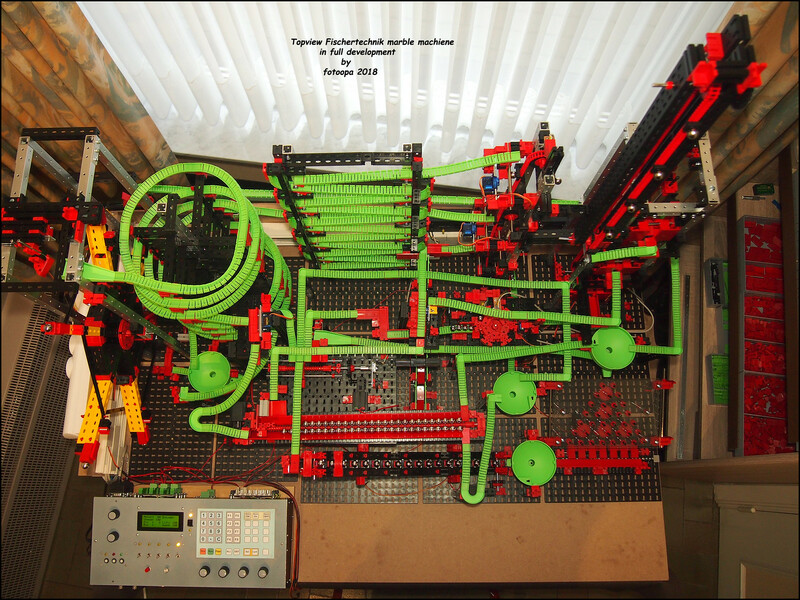 The biggest problem with Fischertechnik assembly is always the stability and reliability. As long as steel balls can leave the track, it is not reliable. At the end of 2017, I started with the complete assembly of the modules in order to be able to define the trajects definitively. The intention of this super ball track wasn't that my grandchildren could build this themselves. They are 5 years, 3 years and 0.3 years and are still far too young. But they can play creatively with it. That's why I designed a programming console where they can set up (programming) the routes themselves. They also have a remote control that allows them to operate certain servos. This way they can still change the route on the road. As a super-user I have my own basic controller where I can handle many more functions. This way I can determine the optimal position of each servo adjustment used, determine the motor speeds and see on a LCD display the status of all the modules, detectors, encoders, etc. How will it proceed now? Colour LEDs will have to be added on all modules (Neopixel WS2812B modules). The FPGA program has already been written and tested for 128 leds. Because the LEDs are placed in a string form, the assembly is the last piece of work only then will I know the number of each LED for controlling the colours. For example, the elevator doors each have 4 LEDs to indicate the status. Even if the lift goes up or down this must be indicated with LEDs. The elevator has 20 LEDs available for this purpose. If I had to wait to make a movie until those LEDs were finished, it would still take too long. Most of the work is to create specific parts that fit on the Fischer blocks to attach the LEDs. I expect a period of 3 to 5 months. First I'm going to make now some movies about the different routes and modules. To avoid making the videos that are too long, I'm going to split this into different parts. There will also be a film about the composition of the hardware. Keep in mind that there are still several months of work in total. The Rob hat geschrieben: Der L war der allererste Kasten in der Dynamic Serie. Am Anfang gab es glaube ich nur die 180mm langen Schienen, nichts anderes. Seitdem ist eine Menge dazugekommen, der L2 (die überarbeitete Variante) ist vom Umfang ähnlich, hat aber eben alle neuen Teile (außer den Klangröhren) mit dabei. Einziger Vorteil vom alten L: Das gibt es in letzter Zeit öfter mal spottbillig. Ich entschied mich für Dynamic L2, gabs bei ebay für 69,-. Berichte bitte, wie er dir gefällt. Ich hab ihn endlich ausgepackt. Es sind viele Bauteile drin. Hab sie in die Sortierwanne gelegt. Also mir fällt der Aufbau der Kugelbahn sehr schwer weil mein ZNS schwer geschädigt ist doch toxische Medikamente und Alkohol. Der Baukasten gefällt mir sonst gut. Die Anleitung ist nicht einfach zu verstehen, z.B. Lochabstände. Ich kann mir nicht vorstellen eine eigene Bahn zu entwerfen in der Größe der 3 Bauvorschläge.